Do you feel prepared to raise calves during the winter season? The lower critical temperature of a young dairy calf is 50 degrees Fahrenheit, which means that the calf’s energy requirement begins to increase in order to maintain core body temperature in conditions below 50 degrees Fahrenheit. As winter temperatures decrease, a calf uses more energy for maintenance, resulting in less energy available for growth and immune function. Preparing and planning for the cold is essential for calves to remain healthy and grow to their full genetic potential. Deliver more energy with a fat supplement: Adding a fat supplement to the milk solution can provide an economical and convenient way to increase the energy content of the milk without needing to switch to a different milk replacer. 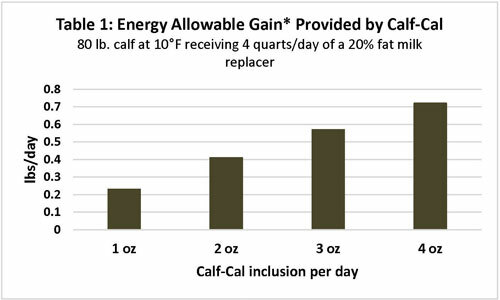 Calf-Cal High Energy Supplement from Hubbard Feeds contains 7 percent protein and 60 percent fat, designed to provide young calves with additional calories during periods of cold stress (Table 1). 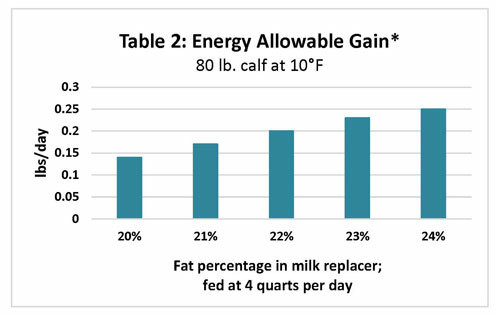 Feed a higher-fat milk replacer formula: Feeding a higher-fat milk replacer increases the energy allowable gain for calves, as seen in Table 2. Using a high-fat milk replacer during the winter months (and even year-round!) gives calves extra calories, but this alone does not significantly change energy allowable gain. Feed more volume of milk replacer solution: Increasing total volume of milk solution fed, as well as increasing the fat percentage of the milk will maximize calf growth potential during cold weather. Providing calves with more solution throughout the day during the cold winter season allows for increased caloric intake, which provides more energy for growth and immune function. 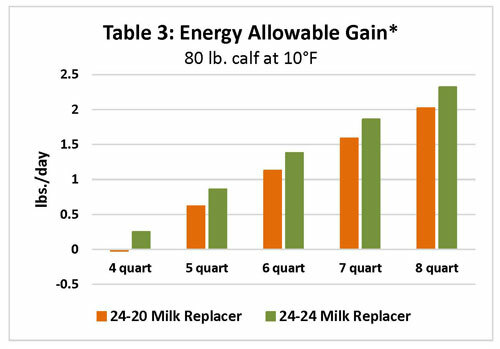 Table 3 shows how increasing the total volume of solution offered per day significantly increases the energy allowable gain of an 80-pound calf in 10-degree Fahrenheit temperatures. Offering a high-quality calf starter is vital for calves to perform well and stay healthy no matter the season. Calf starter consumption in the winter not only promotes early rumen development, but also helps calves generate more body heat via increased energy intake and increased metabolic activity. I thought increasing the fat content and volume of milk replacer would reduce solid feed intake? Traditional milk replacers use animal fat as the foremost source of energy. Collaborative research conducted by Hubbard Feeds and the University of Minnesota has demonstrated that starter intake decreases as the amount of animal fat in the milk replacer increases, or as milk replacer volume fed increases. In cold weather, using the right blend of fats may improve calf health, starter intake, and performance, versus animal fat only. There’s more to the story than just temperature. Body size/breed: Small calves and small breeds (e.g., Jersey calves) have higher maintenance requirements than large calves or large breeds. These smaller animals need to be carefully managed and monitored during the cold winter months. Contact your Hubbard Feeds representative to find out more about cold weather feeding for small breed calves. Hair coat: Calves can adapt to cold weather with a thick hair coat, but they need additional support to maintain core temperature. The hair coat should be dried, fluffed and free of snow, mud, and/or manure as soon as possible after birth. Consider using calf jackets to help insulate young calves once their hair coat is clean and dry. Housing: Calves should be housed in draft-free pens or stalls with proper ventilation. Bedding in the winter should be deep, allowing for calves to nest. Clean and dry long-stemmed straw bedding is ideal in the winter to help insulate calves. Water: Delivering warm water to calves during the winter months helps them digest nutrients and promotes solid feed intake. Develop a plan to deliver warm water to calves immediately after milk feedings, while they’re still standing.